Overprotective parents. 22 and living with parents. Don’t get to go out. Don’t get to meet the love of my life. Pressurized to be the best in studies and not caring about my dreams. I stopped self cutting 3 years ago. Started today because of fight with boyfriend. It was pretty bad. Then I thought why. Why was I cutting? I wondered if others did it for the same reasons. I googled why people cut themselves. Found this in one of the blogs I read. Downloaded the app and chatted. I feel so much better and positive and inspired to do what my heart wants me to. Thank you for making me strong again when I was about to give in to my weak self. And Lance my HopeCoach is a sweetheart and he helped me get my confidence and will power back….Thank you Lance for your kindness and patience. I needed that when I had nobody. 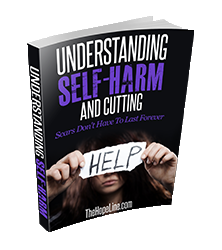 If you struggle with self-harm, download our free ebook: Understanding Self-Harm and Cutting. AND chat or talk with a HopeCoach to get help right now. CHAT HERE. Talk at: 1-800-394-4673.